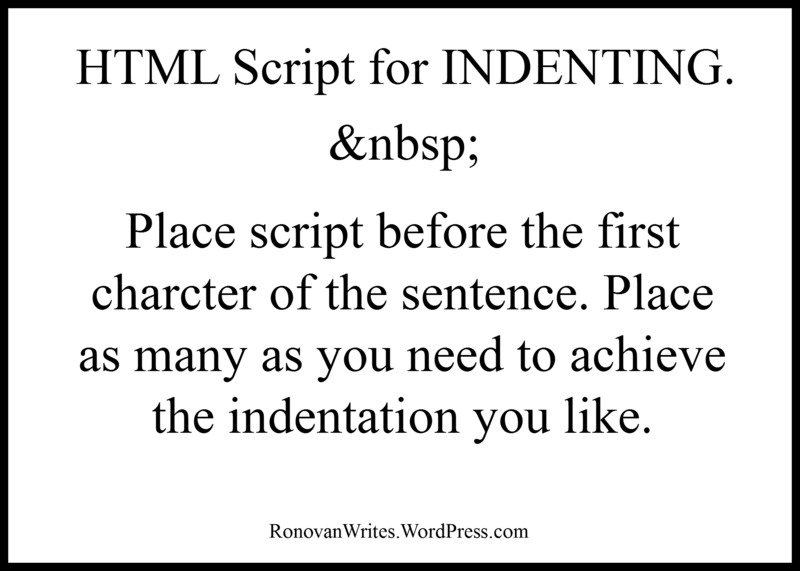 HomeHOW TO Indent in your blog posts. Obviously the word here is LOVE but the letters are not lining up. Let’s see what I can do. If you’ve been paying attention, you realize I am able to help Ann. What Ann is asking is how to indent like we do in Word. Here in WordPress and other blog platforms, everything is aligned left to be flush with the left hand side of the content area. I’ve been indenting during this article so far. In fact I am using one of my favorite pieces of HTML script. I’ll type the characters out separately since I am typing in the TEXT tab of the POST EDITOR. If I did the script all together, you wouldn’t see it. You see 6 characters above. Delete the spaces between the characters and then put the combined script before the first character of your sentence. For example, here in this paragraph as well as the ones earlier, I used 9 of these to create this many spaces. Let’s try making the poem I wrote line up properly. It works. The best thing to do in order to check you are lining up correctly is to use your preview button and check it out. REMEMBER with HTML if you switch to the VISUAL TAB during the creation of the post, you lose your script and have to start over. Until you hit PUBLISH, you will lose your script if you switch over. That’s why I typed the code above with spaces. I’m in the TEXT TAB. You can also use this SCRIPT inside of a sentence. Sometimes I’ve wanted to have things space just a touch bit different in a sentence. It’s like the POST EDITOR wants things to line up a certain way and hates me. Well, you can place the code like so a n d have it do what you like. Now that may look just like a normal space, but how often have you seen something you do and it just won’t take the normal space bar space? Well, use the script and it’ll work. Ann, I hope this helps. Check out my novel Amber Wake: Gabriel Falling. Great info thanks Lovely Ron! I always use text, loathe visual. Never wanted to indent, but that’s excellent information should I need to. Thanks R.
Thank you so much (smile) I appreciate you providing the answer and keeping my original under wraps. Abundant blessings and enjoy your day! Brilliant. I’ve always wondered what that script was. I believe it also causes the large gap you sometimes see at the end of a post before hitting the bottom of the page? By removing it the gap disappears (or so I’ve discovered). Excellent info. Pinned it, thanks.